I am thinking for Christmas I am going to have to have a special 10 for the holidays. 50. I am the worst meal planner. I love to cook, and I am capable of doing so but I get so ambitious. I go to the store and buy all the ingredients I would need to make meals for the next two weeks. I plan it out in my head that I am going to go immediately home and began preparing some of the meals. It sounds perfect, but what ends up happening is I am left with a fridge full of food that doesn't get used. Like just now--I cleaned the fridge out and it was bad, really bad. I need to work on this and not be wasteful. 51. 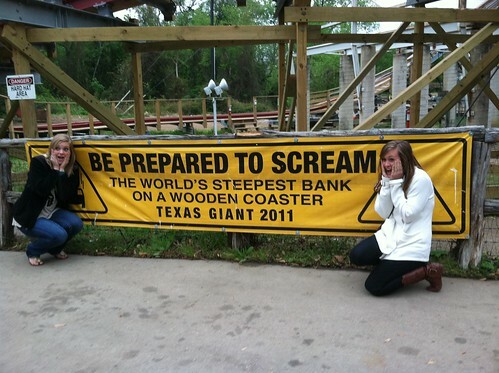 I love a good roller-coaster. I love the thrill and the adrenaline rush. When I was little we had season passes to the Six Flags amusement park in Houston. We went at least twice a month. I think we would still have season passes, but the park closed so they could have "parking for the Olympics" Really?! I even had my "bachelorette" party at six flags in arlington. It was so much fun! 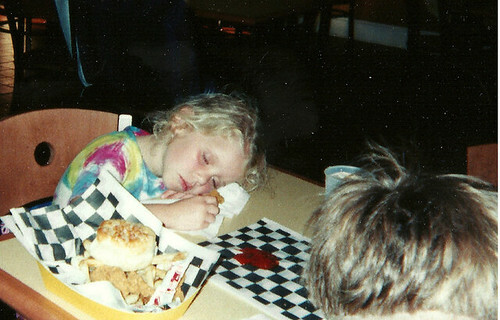 this is my sister falling asleep after a long day at six flags. 52. I feel like I am a bad gift giver. I do love getting gifts and receiving them. My favorite is surprising people even if it is just something little. I like the spontaneous gift, those mean the most to me. When it comes to christmas and birthday that is when I am bad at it. I just can't do it on the spot unless I have something really good thought up. Giving gifts of material value is not my love language. I would much rather spend time with someone and share lots of hugs! 53. I have a bad habit of biting my nails and picking my face. Ugh. I hate it so much. When I get stressed I bite my nails even though I find it disgusting. The only time I don't seem to do it is when I am traveling or there is an important event coming up. I notice I pick my face when I drive. Not a good habit either. Going to work on that. 54. I do well in hard classes and bad in easy classes. I don't know why, but in easy classes I get bored and put my work off. In hard classes I actually work hard and do well. 55. My favorite hairstyle is a braid. I love how versatile it is. It is so easy to change up. You can make it look edgy, boho, elegant, etc. It can fit all occasions and you can fix it up in any way. 56. I hate doing the dishes. We don't have a dishwasher. Therefore, I have to wash every single dish that is used. I have yet to figure out a good system to quickly wash them. We use lots of paper and plastic, but somehow dishes still pile up. Actually....I should probably be doing them right now. 57. I would love to be a wedding planner. I had so much fun planning mine that I would love to plan other peoples. I am helping my friend plan hers right now and I am loving it! 58. I love learning about the holocaust. I have read many books, written many papers, watched many movies and have done lots of research. I remember learning about it in middle school and ever since then I have had a fascination with it. The whole situation breaks my heart and I guess in a way I became captivated by it because I don't want that to happen again. I would love to go to Aushwitz and visit the museums. I saw Anne Franks house in Amsterdam but I didn't get to go inside...I would love to go back. 59. I love layering long bronze necklaces. I will find some that I like and I will wear them with every outfit until they turn my neck green and beyond. The ones I wear now are nearly disintegrating. I should probably find some more but it is hard to part with my old ones. 60. 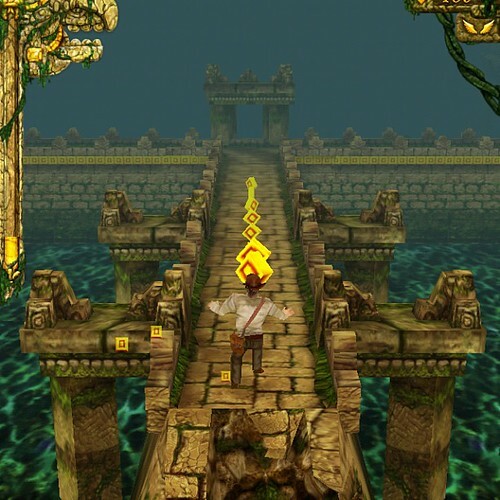 I am currently obsessed with this game on the iPhone called Temple Run. My sister and I are in a competition with each and we are trying to see who can get to 10 million points first... she is winning right now. I too enjoy learning about the holocaust and find it deeply saddening. 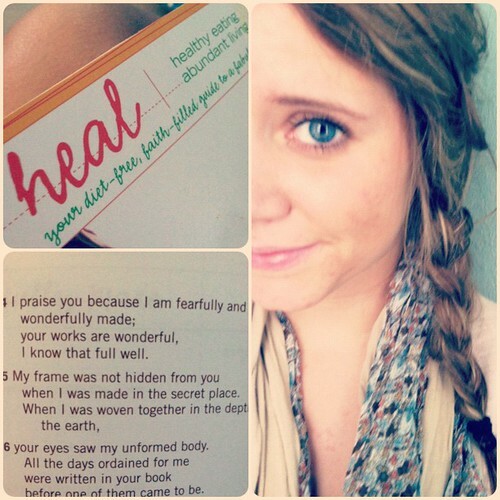 I read a book this summer called Sarah's Key. It is non-fiction, but it is based on true events. It focuses primarily on the people that were rounded up in France and shipped to Auschwitz. It was a really good book. I can't wait until my hair is long enough for a braid. I love braids. 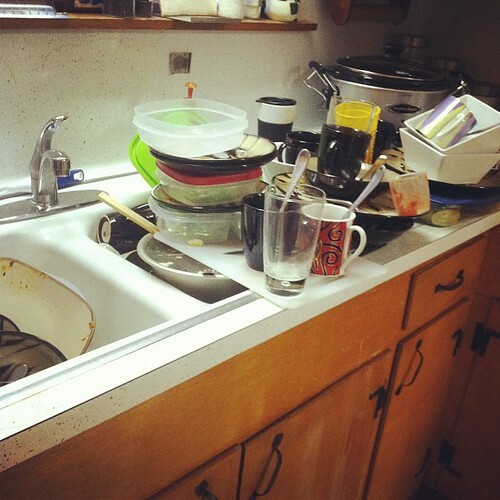 Allen and I let our dishes pile up like that too. I HATE dishes with a burning passion in my soul. I feel like I might comment on every truth, but I'll stop here. I miss you, beautiful lady.